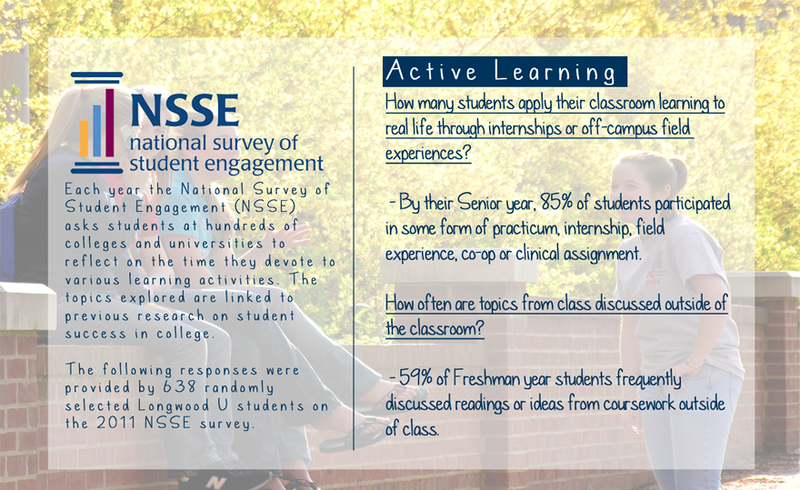 The Student Engagement Team at Longwood University seeks to provide a platform where curriculum and co-curricular opportunities focused on student learning and personal growth are available to all students. The Student Engagement Team will examine student behavior through institutional data to identify student participation in curriculum and other educationally purposeful activities. Through intentional collaboration the student engagement team will promote and facilitate purposeful student engagement throughout the campus community. I was commissioned to create a series of five posters to help show the statistics that were gathered through the recent NSSE survey. All of them feature two-three statistics from a particular focus with a back drop of actual students at Longwood University.